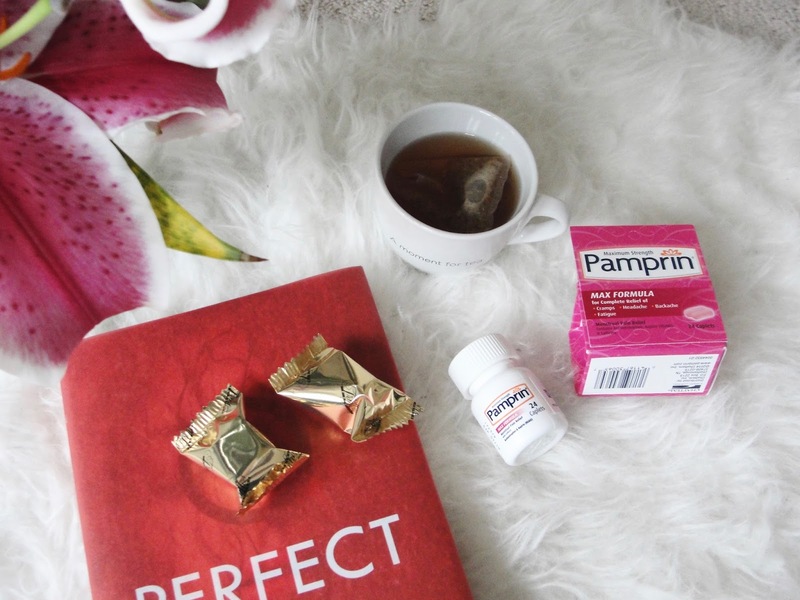 How to feel better during your period with Pamprin! We´ve all been there - at least if you are a women ;-) - cramps, headache, backache, fatigue, mood changes or that bloated feeling, when you have your period. It seems so unfair! Why do we have to suffer once a month so much? But there are ways to make you feel better, prepare yourself well for those days and you will improve these symptoms. 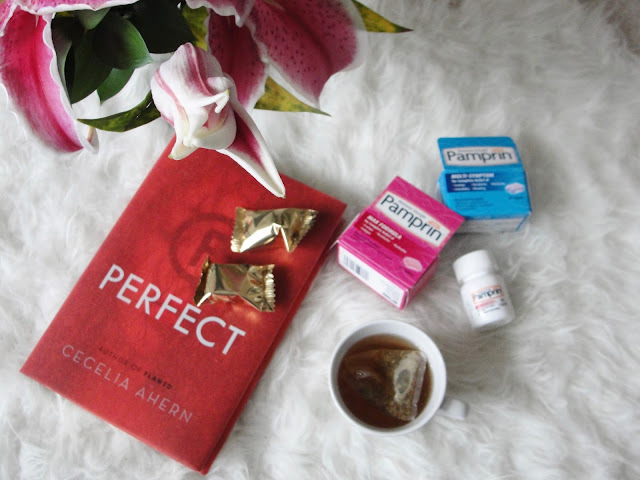 Here´s to feeling better during your period! 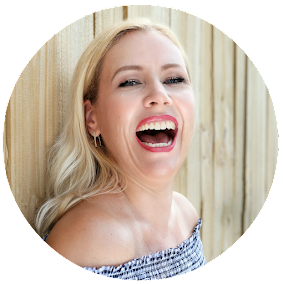 I have 3 tips that should help you to suffer less! While yes, you should ALWAYS eat healthy, but hey! I know this isn´t always easy, but try to stay away from fast food, sweets but also very salty food during your period, as they can make your cramps and bloating worse! Start already a couple days before your period to skip those. Try eating more fresh fruit and green veggies (except, if you know that some of them make you feel even more bloated!). Snack on carrots with hummus, apples with peanut butter, or blend up a smoothie. Plus, fruits and veggies contain lots of water, which is especially helpful during your period! When you eat enough of the right foods, it can make all the difference! Skip caffeine during your period too (can make cramps feel worse! )- instead reach for herbal or fruit teas and of course: drink lot´s of water! I know! It might seem odd that you need to drink more water, when you're feeling the most bloated, but the more water you drink, the more easily you will eliminate the water building up in your body! Genius! 2. Pamper and prepare yourself! Stay positive and treat yourself! Use that expensive face mask, take a hot bath with calming lavender! Try out new tea mixtures (but stay away from black tea!). Read that book you haven´t found time for to read yet, or buy yourself the most beautiful bouquet of flowers to look at! And most importantly: be very gentle to yourself! When we feel positive on the inside, we can do GREAT things on the outside! 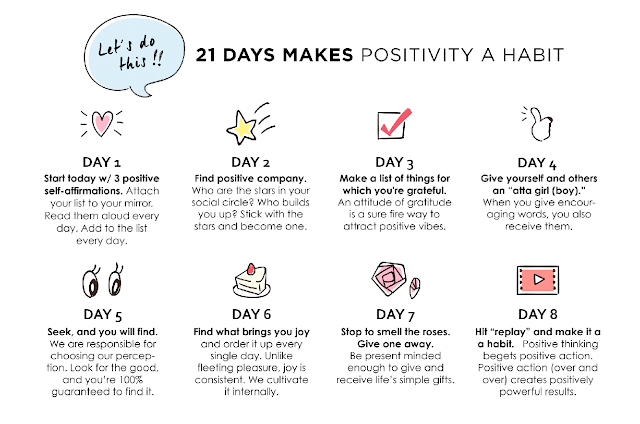 Here´s a little idea to prepare yourself to think positive! 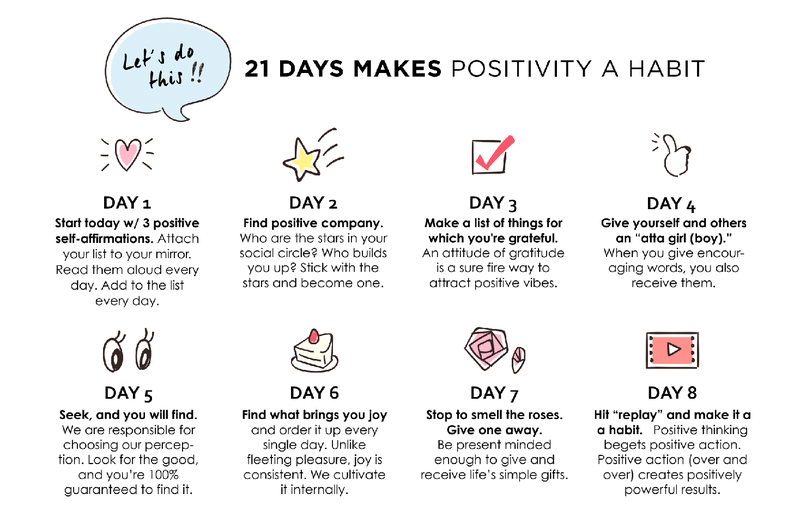 Tape this image to your bathroom mirror and commit to staying positive for 21 days! There is absolutely no shame in taking medicine! Why suffer during your period, when there are such easy solutions to make us feel better! At the first sign of discomfort, I reach for something to ease my pain! Pamprin for example does not only treat the pain- no! It goes much further than that and even helps to relief symptoms such as cramps, headache, backache, irritability, fatigue and bloating! 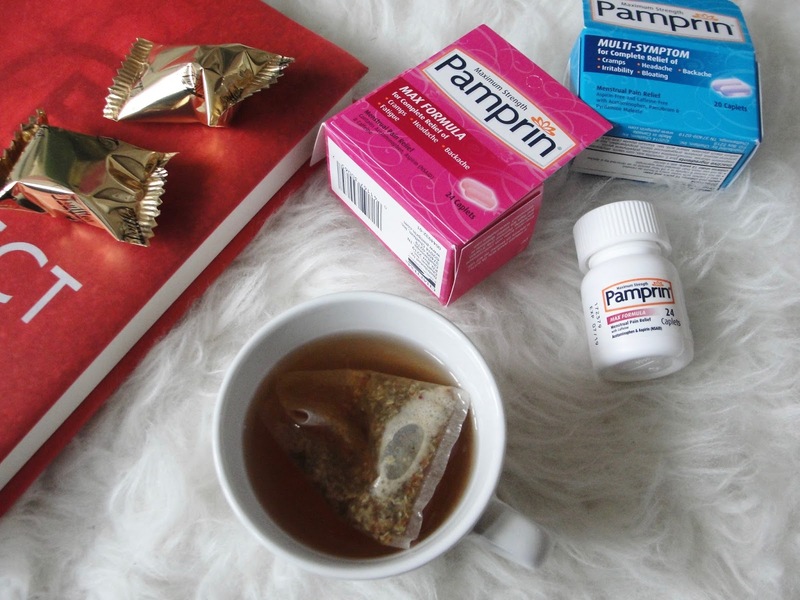 If bloating is one of your issues, try Pamprin Multi-Symptom (the blue box). It´s Aspirin-free and caffeine-free and has the same strength as Extra Strength Tylenol PLUS the added benefits of fighting against bloating and irritability. 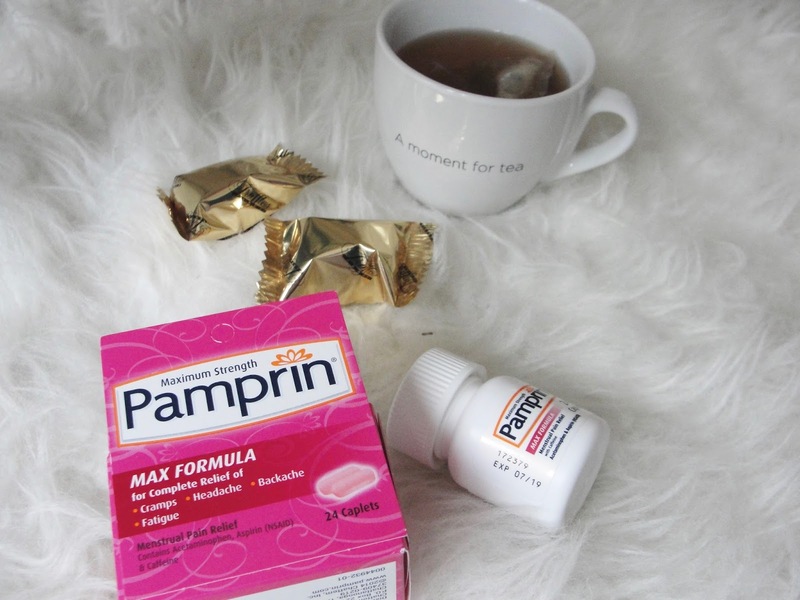 If bloating isn´t an issue and you are more concerned with the pain and constant fatigue during your period, try Pamprin Max Formula (the pink box). It contains Acetaminophen, Aspirin & caffeine for maximum pain relief!